Meatloaf is fairly hard to take pictures of that do it justice. 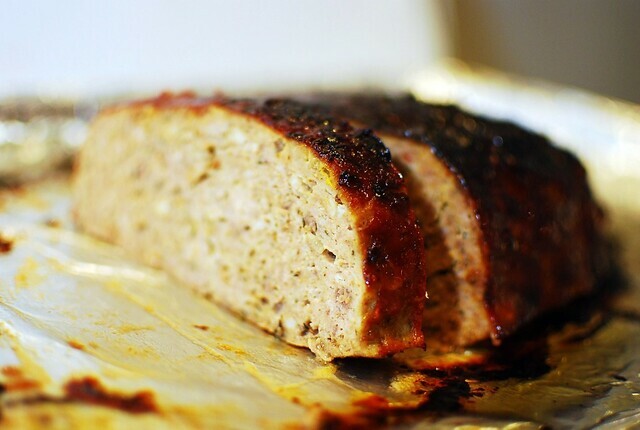 This is the best meatloaf, ever. Take my word for it. Alex and I decided we are going to continue eating healthy but eat meat once in a while, and started off with this meatloaf, since this was on Sunday, before I'd gotten my stitches out and wasn't sure if I should be eating solid food. Don't worry, I'm not going to suggest you put this in the blender at the end of the post. I asked Alex to make this since I was working later than him, and he followed the recipe that I had ripped out of a magazine a while ago. This is from America's Test Kitchen's Magazine, Cooks Country. Whisk everything together in a small saucepan. Set 1/4 c of the glaze aside, then simmer the rest over medium heat until thickened a bit, about 5 mins. Line a cookie sheet with foil and lightly grease. Heat oil and cook onions until softened and lightly browned, then add garlic and cook until fragrant. Set aside. Process the breadcrumbs and milk in the food processor until smooth, then add beef and sausage and pulse until combined. Transfer to a bowl, add onions, eggs, mustard, thyme and 1 t salt and 3/4 t pepper, and mix with your hands until combined. Important! take off your rings that have stone settings before mixing meat with your hands! Preheat your broiler, and lump your meat into a wide, flat loaf. Broil for about 5 minutes until well browned. Brush 2 T of the reserved 1/4 c glaze onto the loaf, then broil again for about 2 minutes, until browned further. Turn the heat down to 350 and brush the rest of the 1/4 c glaze onto the loaf. Bake 40-45 minutes (we cooked ours 42), then remove from oven and tent with foil, letting rest for 20 minutes. Serve with the rest of the glaze to your swooning wife. 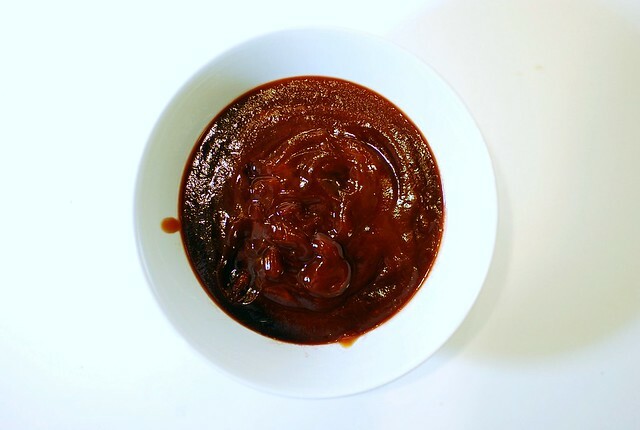 I just happened to make this recipe last week and it was a big hit! It is very tasty. I just used all ground beef because that is what I had on hand and it was still yummy and moist. I used GF oats instead of bread crumbs. I love using oats as the filler in meatloaf. I have recommended this recipe to several people already. Does GF mean ground fine? I can't think of anything else it could mean. My guess is "gluten free". I bet the meatloaf sandwiches the next day would be amazing! It must be fantastic with a title like that! I may just have to try it if its that good. I've never thought to add sausage to a meatloaf, I bet it totally makes it. Mmm looks delicious! Jill...come on, you need to explain WHY it's so important to remove your gemstone rings before mixing meatloaf with your hands! The title of this post certainly lives up to its name...especially in my house! Made this the day you posted it and never got such rave reviews from the family. Everyone from my 18 month old to my college aged brother in law, to my UBER picky hubby couldn't get enough. Wish there were enough leftovers the next day to make your tasty sandwich! BTW - what kind of camera are you using? Your photographs are beautiful and I'm thinking of getting a new camera. glad you liked it! We devoured this. I've got a nikon d60 that I usually use with a 35mm fixed lens, but it really doesn't matter so much what kind of camera as how you use it. Previously I had a point and shoot, you should use it on manual and adjust as many settings as you can, etc. A good camera doesn't always mean good pictures! I am making this right now and used turkey sausage w/the ground beef and omitted the mustard (not a fan) ... hoping it turns out fantastic!! I saw this recipe on America's Test Kitchen maybe a couple of years ago. On the episode that I saw, they used 17 saltine crackers with a 1/3 cup of milk pprocessed thru the food processor. Then 1lb ground chuck, 1lb ground pork add that to the food processor with crackers and process for 30 or so seconds until combined.I've been using that recipe ever since and that was the best recipe I have EVER tasted!! 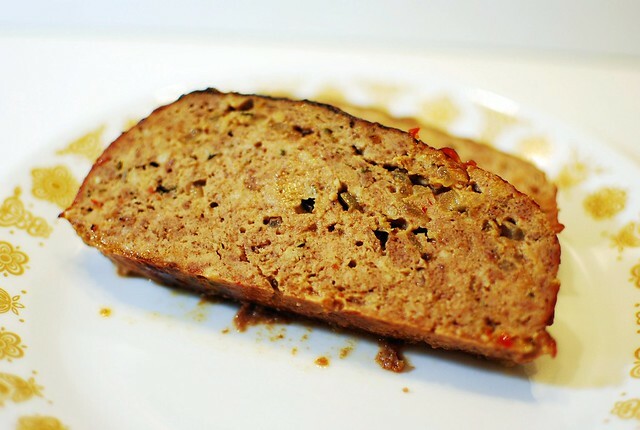 I have been making a variation of this meatloaf for a few years now. My husband was not a big meatloaf fan, but this one changed his mind completely. All of my kids love this recipe, too. In fact, today is my daughter's birthday and she asked for this meatloaf for her birthday dinner. So so so delicious!